The stories in this section are parodies of J R R Tolkien's The Lord of the Rings and The Lord of the Rings movie trilogy as well as original Tolkien Fan Fiction written by Mercedes Dannenberg, James Haines, Miranda Givings, Derek Tree and a few other contributors too shy (or sensible) to be named. Some are re-workings of familiar chapters, such as 'The Lord of the Scrolls' — a parody of chapter Two 'The Shadow of the past', of Book I of 'The Fellowship of the Ring', others, like 'Ringwraiths terrorize English Town', are spoof news stories which introduce the mythology of Middle Earth into our 21st century world. Yet others, are entirely new parodies, like Eggo Waffles' hilarious tale of The Heirs of Gondor, in which Boromir and Faramir search the city's archives in a most unusual quest for knowledge.. 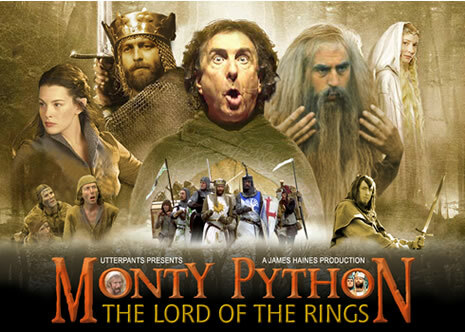 Finally, there is 'Monty Python - The Lord of the Rings', a monumental work spanning 64 web pages which has been described as 'A Comedic Masterpiece of Heroic Proportions' by some and a 'complete waste of bandwidth' by others. Whatever posterity may say, we are in no doubt that the very talented James Haines is a rarity among American humorists, who not only appreciates the silliness of British humour, but has captured its very essence in this pant-wettingly hilarious marriage of J R R Tolkien and Monty Python. Unlikely bedfellows at the best of times, James has not only managed to make their union utterly convincing, but also poke fun at the story without in any way diminishing the staggering achievement of Tolkien in writing it, nor Peter Jackson in bringing it to the silver screen. Of course..we may change our minds when the Tolkien Estate and/or 'Monty Python' sue the pants off us! We hope that you will derive as much amusement and entertainment from these stories as we did in writing them!